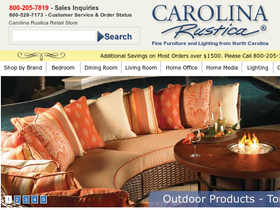 At Carolina Rustica, online at CarolinaRustica.com, they offer North Carolina Furniture, Iron Beds, Lighting and Ceiling Fans. Find the furniture your looking for the bedroom, dining room, living room, study and office, media room, kitchen, powder room, and foyer. Carolina Rustica offers popular furniture brands including Cooper Classics, Hickory White, Kessler Furniture, Lexington, Palliser and so many more. You'll find furniture for every room and everyneed including lighting, and fans. So check out Carolina Rustica. But first stop by RetailSteal.com to find the best Carolina Rustica coupon codes, Carolina Rustica discounts, and Carolina Rustica promotions. All lighting, ceiling fans and most home accents qualify for Free Shipping with the only restrictions being shipments to APO's, Alaska, Hawaii, and Puerto Rico. See website for full details, exclusions may apply. Get 10% off Troy lighting from CarolinaRustica.com with this code. Click link and save. Enjoy $10 savings on all orders over $50 from CarolinaRustica.com using this coupon code. Click link to shop and save. Act now and enjoy a 15% discount on Uttermost, Cooper Classics and Hickory Manor House Mirrors & Clocks with this coupon code from Carolina Rustica. Shop lighting and fans at CarolinaRustica.com and get free shipping. Click link now to shop. Visit Carolina Rustica and use our exclusive coupon code to save 15% on your purchase of any Meyda Tiffany lighting. Shop at Carolina Rustica and use our coupon code to save 10% on Stone Country Ironworks, Bauer, Johnston Casuals, and Padmas Plantation. Click link and use code to save. Save up to 80% on select furniture at Carolina Rustica. Click link to shop. Save up to 75% on clearance furniture when shopping at CarolinaRustica.com. Click to save. Shop Carolinarustica.com and save an extra 5% discount on all clearance items with this coupon code. Click link to shop.